Warr-Lane building 309 W. Main (now Studio Milan; earlier it was Krings Riverside Floral) was built in 1913. Link and Haire were the architects. Gagnon and Co. of Billings was the contractor. In 1892, Austin Warr (1866-1917) helped to establish the Montana Hardware Co., married Helen Lehman in 1895, and worked at the Bank of Fergus County. James E. Lane (1871-1931) married Rose Wiley in 1900 and organized the Montana Lumber Co. in 1902. They joined together to build the Warr-Lane Building in 1913. “J.E. Lane and A.W. Warr are having plans drawn for a four-story building on Main Street [between Third and Fourth Avenues]. This will cost $25,000 at the lowest estimate.” (Fergus County Democrat, Dec 17, 1912). “…. will be built of Lewistown brick, as will a new four or six-story building to be built on Main Street by Messrs. Warr and Lane.” (Fergus County Democrat, Dec 17, 1912). “J. E. Lane and A. W. Warr were granted a permit to raise their frame building adjoining the Annie Crowley property on Main Street in order to permit them to begin the construction of their handsome business block.” (Fergus County Democrat, February 25, 1913). 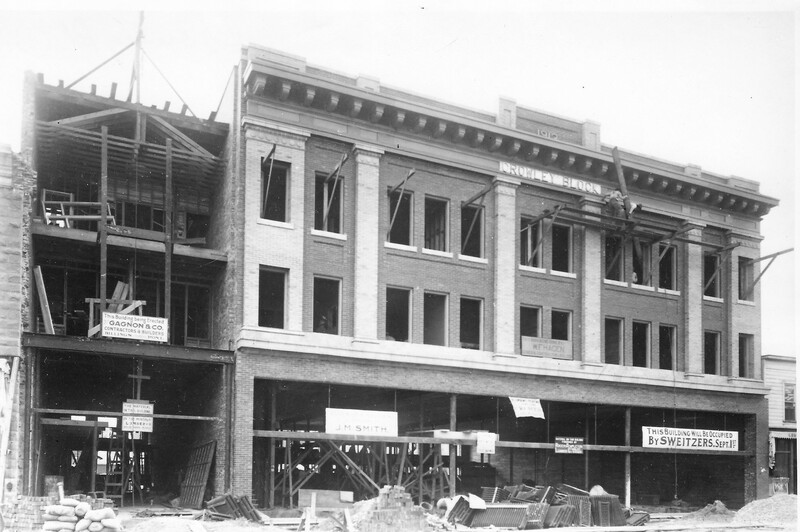 “A notable addition to the list previous published in the Democrat is the block to be erected by J. E. Lane and Austin W. Warr on the site immediately adjoining Bennet’s jewelry store, upon which latter ground part of the new Crowley building is to stand. The Lane-Warr building will be three stories high,… and the front will be one of the most striking in the city. The plans, just completed by Link and Haire, are for a remarkably handsome front which, while ornate, has no suggestions of anything tawdry. The Marquetry effect, with the use of bent glass, is something new here and this front is sure to be much admired. If anyone fear that there will be overbuilding in the business district, it may be remarked that Mr. Warr, up to yesterday, had received fourteen applications for the rental of the ground floor.” (Fergus County Democrat, Feb. 25, 1913). “Contractor James M. Smith yesterday began laying brick on the Crowley Block and the Warr-Lane buildings on Main Street.” (Fergus County Democrat, May 27, 1913). “The handsome block adjoining the Crowley building erected by A.W. Warr and J. E. Lane has been leased by Mr. Short of North Yakima who will open a high-class ladies furnishing establishment there.” (Fergus County Democrat, Sept. 16, 1913). “Warr-Lane Building Main Street, Link and Haire architects. Cost $25,000. The front of this building is one of the most ornate in the city. The front and cornice are of terra-cotta. It is three-stories high finished in oak with stonewood floors in the bathrooms and toilets. The ground floor has a front of bent art glass with a wrought iron marquese, which has yet to have a frieze of colored glass around the bottom. The second floor is devoted entirely to offices, while the third floor is divided into two modern apartments. In the rear is a fire escape and garbage chute.” (Fergus County Democrat, December 16, 1913). The Warr-Lane building (309 W. Main) is on the left and the Crowley Building is on the right. They were built at the same time. The stairs going to the upper floors are located inside the Crowley Building next door. (Photo courtesy of the Lewistown Public Library). The Warr-Lane building in 1980’s. (Photo courtesy of the Lewistown Preservation Office). Find books & other materials for use on your electronic reader in our virtual library branch! The cookie settings on this website are set to "allow cookies" to give you the best browsing experience possible. If you continue to use this website without changing your cookie settings or you click "Accept" below, then you are consenting to this practice.